To set it up, first, visit the Services page in Team Settings in ScrumGenius, and copy the API key listed there under the Zapier section. 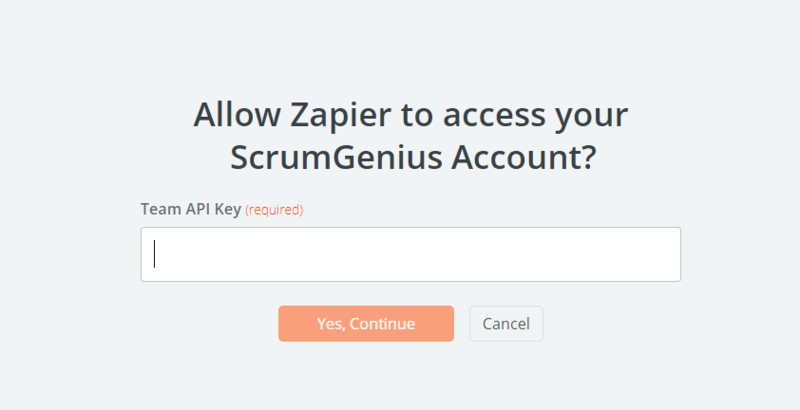 This is your team's unique key that you will use to connect your Zapier account to ScrumGenius. Navigate to the Connected Accounts Tab on the Zapier home page. Click the Connect a new account dropdown and type in ScrumGenius. That's it! You are done and ready to begin creating custom Zaps. When a report is sent out, either through the auto scheduler or by a Manual run, this will be triggered. When a team member submits their standup answers, this will be triggered. When the report summary period ends, this will be triggered. This will be triggered for each report sent to a member. Returns a list of all members who have not submitted their standup answeres yet. Add custom activity to the ScrumGenius Team Activity section.